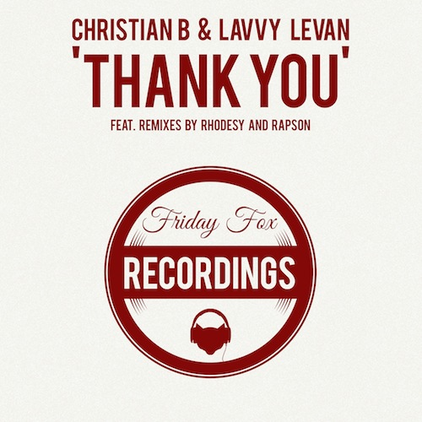 Christian B & Lavvy Levan continue to gather momentum with their homegrown Friday Fox Recordings label. Ready to possibly raise hands on the terraces of summer 2014, the duo deliver a heartfelt message dedicated to the greats of the house music scene with 'Thank You'. Drizzled with bubbling ‘90s vibes, this deep house groove with soulful keys sees Lavvy give thanks with a special spoken word before the piano breakdown arrives. Paul Rhodes takes it to the club, injecting driving percussion, piano stabs and a bassline on his re-interpretation. Also on the release, 'So Special' is an honest declaration of how love really does save the day! Marc Rapson joins team Friday Fox again on remix duty, delivering a deep bumping bass groover! 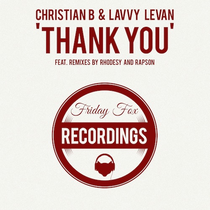 The ‘Thank You’ EP is out 23 June on Friday Fox Recordings.